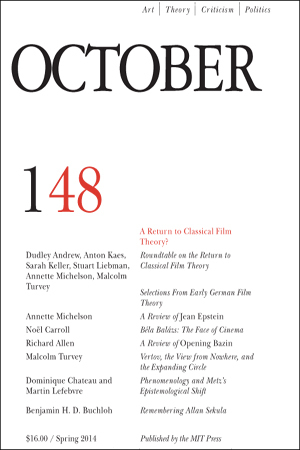 This issue is titled „The return to Classical Film Theory?“ and the cluster intends to address this and many other questions regarding the topic. The roundtable brings together leading scholars of classical film theory who have been instrumental in generating renewed interest in it. A short excerpt from Anson Kaes`, Nicholas Baer`s and Michael Cowans`s forthcoming anthology „The Promise of Cinema: German Film Theory, 1907-1933“ is published here. Three essays review recent anthologies of writing by and about the major classical film theorists Béla Balász, Jean Epstein and André Bazin. Malcolm Turvey argues in his essay that Dziga Vertov`s concern to establish a „bond“ between the viewers of his films and the workers depicted in them has theoretical and practical, not merely historical relevance toady. Available at Do you read me? !